The Swiss National Bank’s unexpected abandonment of the Swiss franc cap continues to reverberate across global markets (examples listed below). The currency settled around parity, which is about 17% above the cap (the euro is 17% lower). At this level the SNB loss on its massive foreign currency position (mostly euro) is somewhere around CHF 75 bn. 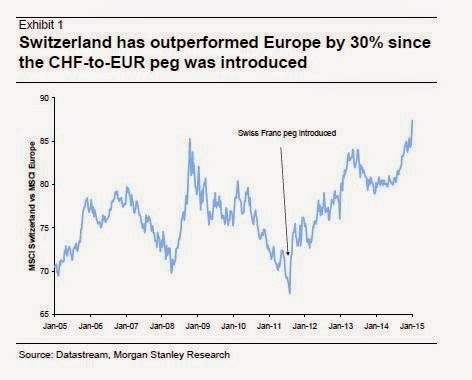 The buildup of euros was the result of having to defend the franc cap when capital was flowing out of the Eurozone into Switzerland (the SNB had to buy euros and sell francs). The central bank came under enormous criticism domestically for becoming so exposed to the Eurozone. But now the central bank is cutting its losses and walking away from having to buy any more euros. In the past few years, the currency cap resulted in (relatively) easy monetary policy by keeping the franc artificially weak while the SNB balance sheet expanded via the euro purchases. While the mechanism was different than what we had with other central banks who have undertaken quantitative easing, the SNB's balance sheet had ballooned in recent years (see chart). As a result, the nation’s stock market had outperformed other European markets by some 30% since the cap was instituted. 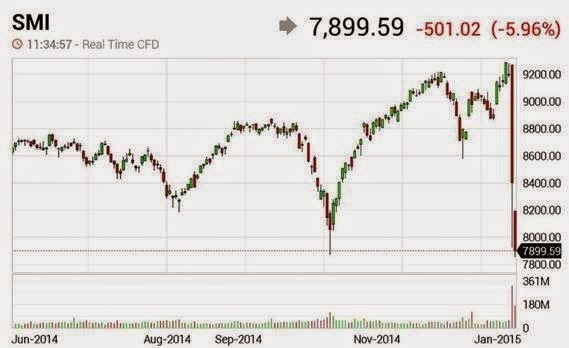 When it comes to pumping up the stock market, easy monetary policy clearly works. But once the valve was opened and the Swiss franc was allowed to appreciate, the Swiss stock market gave up some 15% in just two days (chart below). In effect the SNB ended its version of “quantitative easing” in a few seconds rather than by “tapering” as was the case in the US. With this decision the SNB has lost a great deal of credibility - not due to the change in policy but due to its execution. The central bank looks divided, uncertain, and subject to political pressures. Switzerland was already entering deflation before the currency was allowed to appreciate. Now the nation is about to undergo what Japan had a few years back. During the Eurozone crisis, the yen which - just as the Swiss franc - was a "safe haven" currency, strengthened significantly, nudging Japan into deflation. The situation in Switzerland is now similar, except that rather than easing policy further as the BOJ did, the SNB tightened it. For the Swiss economy difficult times lie ahead.